Do You Want to Feed Your Family Well? Figuring out what to fix for dinner every night is a major source of stress for many moms, but what if I told you it didn’t have to be that way? What if 5:00 wasn’t the most stressful part of your day? What if meal planning wasn’t such a frustration? What if you felt good about what you were feeding your family every night? What if you did all of that AND saved hundreds of dollars on food every year? What if I told you all that was actually possible because I’ve been there and done it? I used to stress about what to have for dinner every night, too. But then I found the right systems and tricks that changed all of that. And I’m sharing all of my best tips, tricks, and strategies in one book — The Every Mom’s Meal Solution Handbook! There are many great programs out there that provide meal plans. And those can be extremely handy time-savers. But what works well for one family doesn’t work at all for another. And that’s why I wanted to offer a guide that will give you the tools you need to create a system that works for you — your season, your budget, and your lifestyle. This book is also not going to tell you what or how to cook. I’m not going to push any special diets or tell you that you have to cook a certain way. That’s the beauty of this system — you set your own food goals and I simply guide you into becoming the master of your own meals. 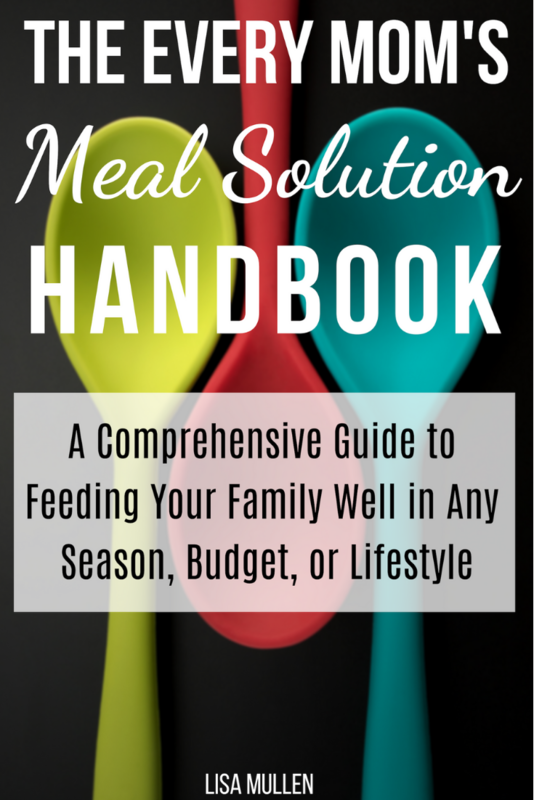 The Every Mom’s Meal Solution Handbook is a comprehensive guide to help you get healthy, homecooked meals on the table in a way that works for you and your family. In this handbook, you’ll learn tips, tricks, and strategies that will equip you to feed your family wholesome, balanced meals whatever your season, budget, or lifestyle. Regardless of whether you’re a stay-at-home mom, a work-from-home mom, or a work-outside-the-home mom. Or maybe not even a mom at all! Whether you love to cook or you hate to cook, whether you’re on a tight budget or no budget, and whether you’re an experienced cook or a novice in the kitchen. If you get any of these things, the money you spend on The Every Mom’s Meal Solution Handbook will be well worth the investment. But you don’t only get one. You get them all! In the book, you get all these things and more. And I can speak with complete confidence because I know first-hand the difference it made in my meal management system… and my stress levels! If you could use a little more peace and a lot less stress when it comes to feeding your family well, then I encourage you to consider getting The Every Mom’s Meal Solution Handbook and seeing what it can do for you! So, what do you say? Will you join me as we conquer these strategies together? Let’s learn how to feed our families well!